Since 2018 the Lemonaid & ChariTea Foundation has been cooperating with ‘The Keiskamma Trust‘ in the South African city of Hamburg, a fisher’s village at the mouth of the Keiskamma River. The Keiskamma Art Project is the flagship of the Trust, which primarily helps women and young people to generate income and build a network of connections and skills in their community. The Keiskamma Trust deals with issues such as poverty and health issues, such as HIV. Particularly in and around the rural area of Hamburg. It has developed through a variety of initiatives such as a health programme, an education programme and a music programme to address the challenges of the area with the most holistic approach possible. The communities in Hamburg primarily suffer from an unemployment rate of 78%. Among other things, this is expressed by a very low income. This is precisely why Carol Hofmeyr founded the Keiskamma Trust in 2001 and first introduced the Keiskamma Art project. Women from the community take part and learn a craft, which provides space for networking and income. The art programme has been very successful over the years with support from various organisations. Some artworks have been lent to exhibitions. Most have been sold and thus increased the livelihood of people in Hamburg and surrounding communities. The Lemonaid & ChariTea Foundation supports the Trust with funding for this art program. Through training in marketing and sales the programme contributes to income-generation. The number and quality of the artworks have developed over the years; new things have been added, artworks have been continued and shown in many exhibitions. A list of the latter can be found on the Cape Gallery website. 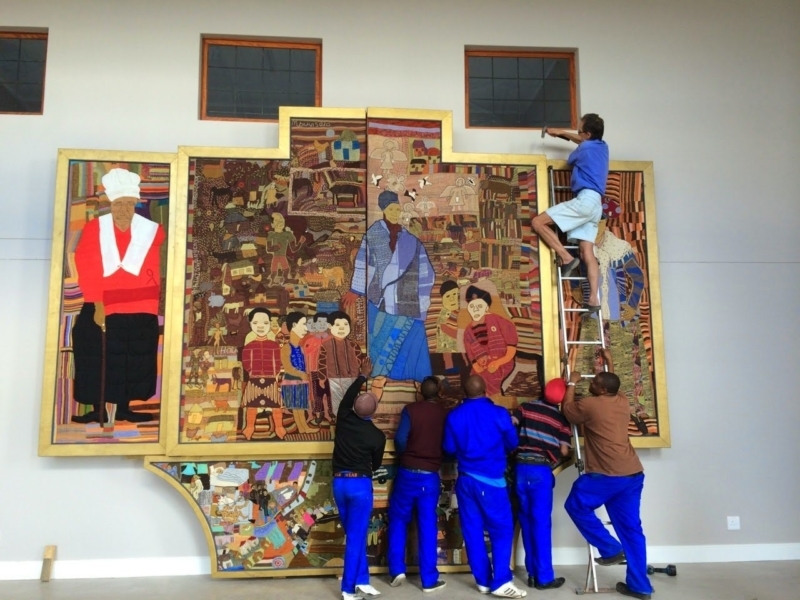 Embroidery, beadwork and wire art also preserve the Xhosa culture, heritage and environment. Those are represented in different ways on the artwork. amaXhosa* are represented throughout South Africa, but are concentrated in the East Cape, where Hamburg is located. The program runs a collaborative art business and workshop. In the community in and around Hamburg, members have very few opportunities to work. Jobs offered in the region are generally part-time jobs, which are very badly paid, so that people need additional social grants to cover their living costs. An important point is that the art programme provides a remedy, but it does so much more: it imparts self-esteem, independence, education and competence development to young people, women and men. The main goal is for the participants to acquire additional skills. Not only in the art itself, but also in marketing and sales. In addition, the Trust will generate money that will provide a basic income for existing employees. Furthermore, creating new jobs for more people, and thus, provide an opportunity to earn a living. As the Trust has been working in and around Hamburg, they know what they need. Therefore, they developed a plan to increase turnover and viability of the programme. In the future, they will no longer have to rely on external funding, but will be able to support themselves. In figures, this means to create five more sales opportunities or increase the current ones and to achieve a 30% annual increase in profits over the next three years. Mostly for economic reasons, the Keiskamma Trust found itself in a position where fundraising was increasingly difficult to maintain. Therefore, they decided to embed a business plan in their activities and make the arts programme as profitable as it has to be. Meaning in order to enable it to employ more women and men on its own. At the same time, demonstrating a higher level of professionalism in craftsmanship and management. The three years mentioned above will be funded by the Lemonaid & ChariTea Foundation in order to support the Trust’s activities to achieve its goals. By the end of 2021, a total of 80 people are expected to be employed; the current figure is 47. In order to achieve this goal, the Trust will conduct workshops in design and product development. They will participate in exhibitions to increase visibility of works of art, and evaluate the work already done, on a regular basis. At the end of the funding period, the programme will be funded entirely by the local community. Additionally, their income will be at least within the national minimum wage legislation. The Keiskamma Trust offers solutions to a wide range of problems in its region in order to achieve the most holistic change possible. 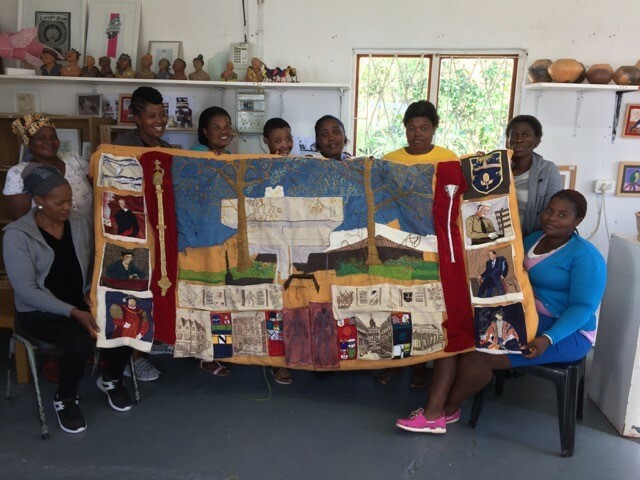 With the Keiskamma Art Project they tackle the high unemployment rate, contribute to communities and income generation and support the preservation of the Xhosa culture. *Xhosa is one of the many cultures represented in South Africa. While the culture itself holds the name Xhosa, the people who live it call themselves amaXhosa. The language the amaXhosa speak is called isiXhosa.